Dyneley House Private Hotel, Newmarket Street. This building is beautiful, I remember going here. Does anyone remember Dr Merrill , Dr Watson? Does anyone know where Harts Head Inn was? I remember when I was a little girl with my Mum & Dad living with my Aunt, Miss Sarah Metcalfe, who owned the Dyneley House Hotel. It had a tennis court & there was a stream at the bottom of the garden. Reluctantly she sold the Hotel, probably due to a fall in visitors. The other Hotels in Skipton were licenced, she didn't wish to work longer hours catering for revellers as she was getting older. What a shame to lose such a building. That's progress! I remember there was a sign at the front which read 'Dyneley House Temperance Hotel' or something similar. I often wondered what temperance meant. This was the residence of mill owner JB Dewhurst in the 19th century. He later moved to Aireville on the death of the owner: solicitor and banker, Henry Alcock. Ken Ellwood lodged here in 1955. 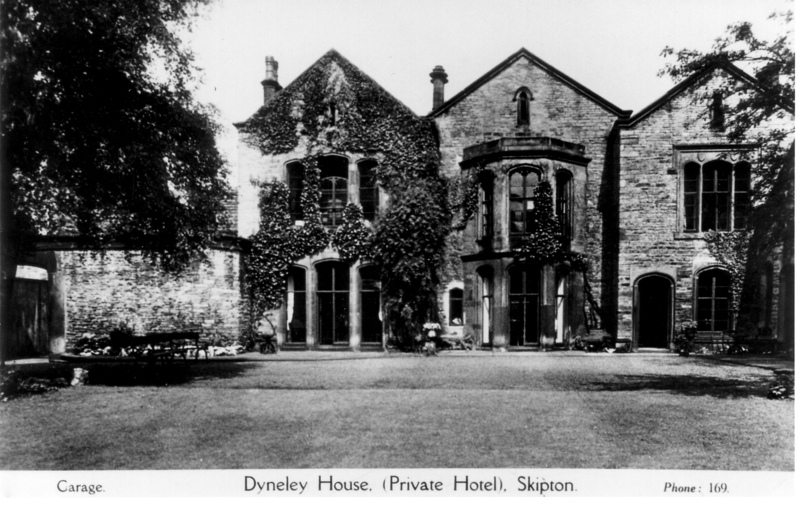 My grandmother (who was walking with her pack-donkey to Scotland) stayed here, Dyneley House Private Hotel, Skipton, on 18th August 1923. The Devonshire Arms was full up because the next day was Show Day. In her diary she wrote, "Dyneley House is comfortable and run by very kindly people." She had a musical evening with guests and their friends. Addition to my comment: Date was Friday 31st August 1923, and my grandmother writes that the Dyneley House Private Hotel owners were the Carrs.